CANTON, Ohio, March 27, 2019 /PRNewswire/ -- TimkenSteel (NYSE: TMST, timkensteel.com), a leader in customized alloy steel products and services, today published a sustainability policy that highlights its ongoing commitment to transparency and long-term prosperity. The policy follows the release of the annual report to shareholders and proxy statement, both of which provide a holistic look at the company. The company formed a cross-functional sustainability committee in 2018 to create the policy as a single statement to encompass the collection of sustainability policies the company has had in place since its formation. Those policies have led to industry-leading performance in areas such as safety, environmental responsibility, governance, risk management, employee engagement and community support. The newly published comprehensive policy also documents goals and objectives that will continue to improve company performance and guide cultural leadership, environmental stewardship and economic impact. "As we've grown and evolved as a new company, we've been rooted in a set of core values that drive our social responsibility and sustainability," said Tim Timken, chairman, CEO and president. "Our shareholders, customers, suppliers and community partners are increasingly interested in this holistic look at the company, so we've published a comprehensive sustainability policy to provide even greater transparency." Building on its position as a leader and innovator in the steel industry, TimkenSteel already has made significant headway toward its sustainability goals. 2018 was the company's safest year on record as a result of a sustained program of employee engagement over the last decade. The company also had record environmental performance. TimkenSteel manufactures nearly 100 percent of its steel from post-consumer recycled metal and, in 2018, it increased overall recycling by 8.4 percent, water recycling by 17 percent and the amount of electric arc furnace dust recycled by 16 percent. In addition, TimkenSteel has been recognized for culture leadership, receiving awards for being a family-friendly workplace and one of the best places to work in Northeast Ohio based on employee satisfaction and engagement. It also received a regional award for its performance-based compensation plan structure. 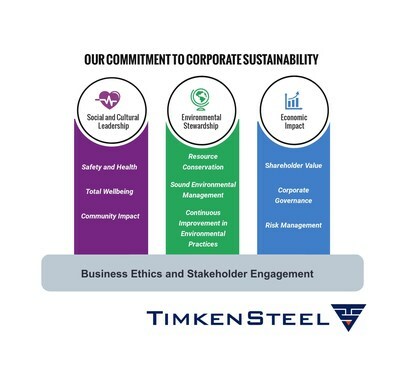 TimkenSteel's sustainability policy and additional information about its goals and objectives can be found at: www.timkensteel.com/corporatesustainability. TimkenSteel (NYSE: TMST, timkensteel.com) creates tailored steel products and services for demanding applications, helping customers push the bounds of what's possible within their industries. The company reaches around the world in its customers' products and leads North America in large alloy steel bars (up to 16 inches in diameter) and seamless mechanical tubing made of its special bar quality (SBQ) steel, as well as supply chain and steel services. TimkenSteel operates warehouses and sales offices in five countries and has made its steel in America for more than 100 years. The company posted sales of $1.6 billion in 2018 and also achieved its safest year on record. Follow us on Twitter @TimkenSteel and on Instagram.